Soft, creamy, spreadable, Nut Free Vegan Cream Cheese made with only SIX ingredients (+ salt and pepper) you probably have at home RIGHT NOW. No funny stuff. I know I need to but I still haven’t bought half the ingredients needed to make all the fancy-schmancy vegan cheese out there… yet. Ohhhhhh my goodness guys. 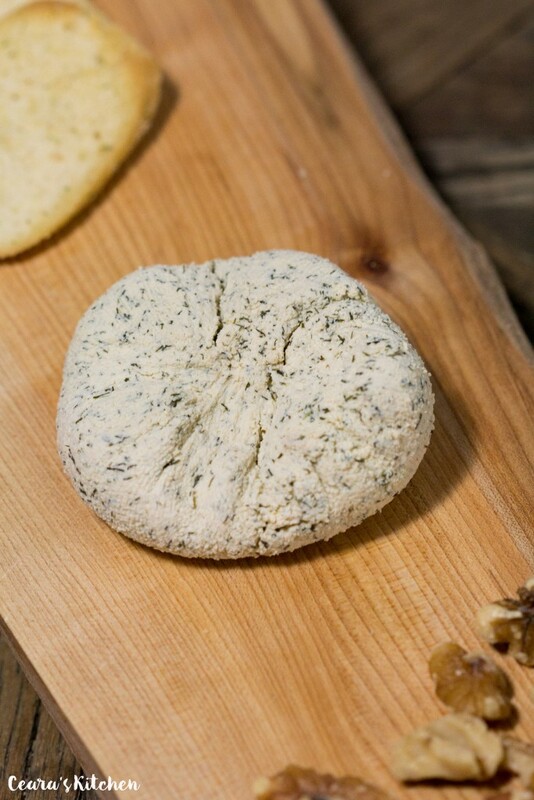 This mild vegan creamy cheese has the texture of a perfect, fresh goat cheese or boursin. It is perfect for a cheese tray, spreading on crackers or eating by itself! Like a lot of people, I grew up LOVING cheese. My family takes cheese pretty seriously. I grew up on brie, camembert, chevre… all of it. And then I moved to France on exchange a few years ago and literally indulged in ALL the beautiful French cheeses. When I came back from France I slowly transitioned to vegetarianism and started making my own cheeses at home. Some succeeded and there were many countless #cheesefails, ha! Cheese is probably the first thing that comes up when people learn I’m vegan. I probably would have been skeptical too in my pre-vegan days but making Vegan Cheese at home can be affordable, tasty and remind you exactly of the dairy stuff we all grew up on. Seriously. This Vegan Cream Cheese is based off a traditional, simple cheese my stepmom grew up on that her mom loves to make – thank you for the wonderful inspiration Nezihe! The soy milk curdles and little beautiful chunks of white cheese start to appear in the milk. Add in the spices (salt, pepper, dill and garlic powder). Stir and drain. That’s really all there is to it guys! 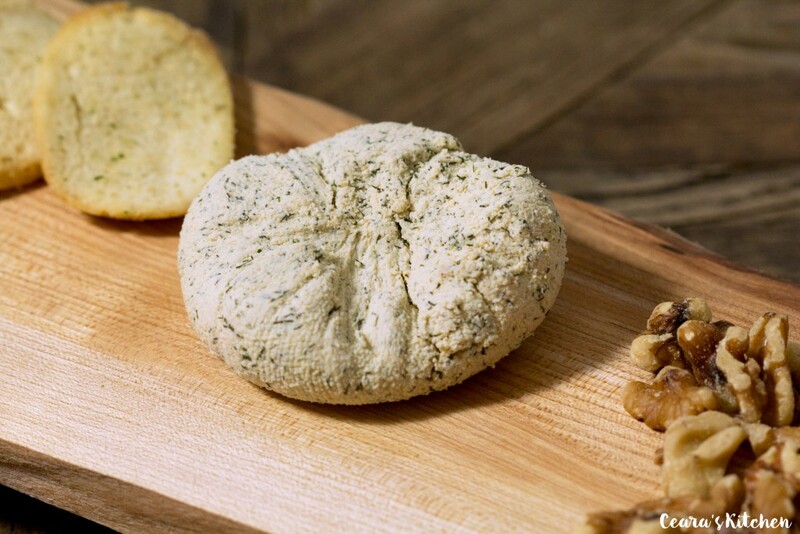 A mild, soft and creamy vegan cheese with the perfect texture! 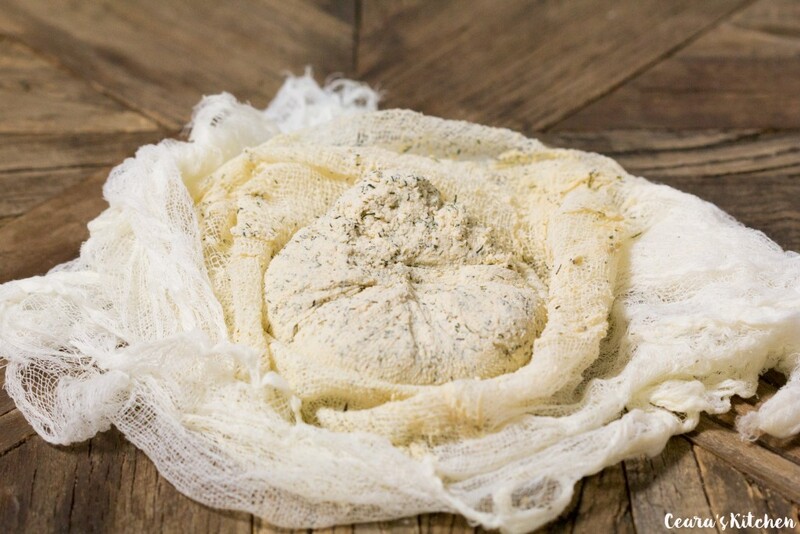 This cheese is perfect for spreading on crackers, on a cheese tray or even by itself! The texture reminds me of goat cheese or boursin. Place a strainer over a deep pot. Place the cheese cloth over the pot. This is where you will pour your milk to make the cheese when it is ready (see photo for reference). Note: It’s important that your pot is deep so the cheese doesn’t come into contact with the liquid overnight. In a large pot, over medium high heat, simmer the soy milk until a light boil occurs. Stir constantly with a whisk and watch the milk carefully so it does not boil over! It is important to continue stirring the entire time your milk is on the stovetop. Once the soy milk comes to a light, rolling boil, add the lemon juice and stir. After about 30 seconds you should see some curdling start to occur (little white chunks of cheese will start to appear!). Add the sea salt, black pepper, garlic powder and dill. Turn down the heat and stir for another minute or so. At this point your milk should be really curdled (lots of beautiful little chunks of cheese separating from the milk!). Stir in the nutritional yeast (I used 1 1/2 tbsp but use 2 tbsp if you want a cheesier flavor) and apple cider vinegar into the milk mixture and whisk lightly. Tightly tie the cheesecloth at the top (see photo for reference). Place a weight on top of the cheese cloth to help it drain faster and the cheese to solidify. 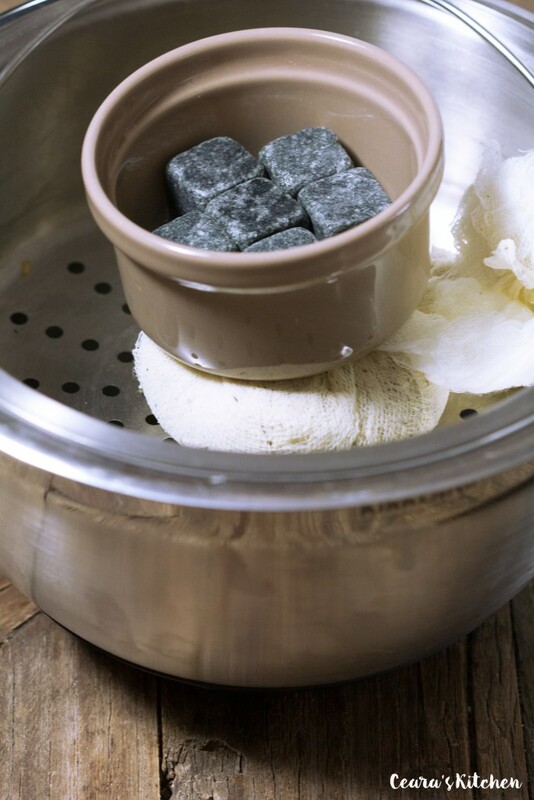 A clean rock or ramekin full of stones work well as a weight. Place in the fridge overnight. In the morning, the whey will have separated from the milk into the bottom bowl. Carefully unwrap your cheese. Enjoy by itself, with crackers or on fresh bread! 1) This cheese is very mild. After making it once, feel free to try a variety of different spices! [br]2) It’s very important that your soy milk is not flavored and unsweetened. [br]3) Do not use other types of milk in this recipe – only soy milk will work! It was a fun chemistry experiment, but nothing edible came of it. I used Silk brand soy milk (unsweetened with some ‘natural flavor’). After adding the lemon, the soy boiled up and curds started, then disappeared. I poured it through cheesecloth, anyhow, in the hope there were some curds I couldn’t see — and it just kept pouring, trapping all the flavorings the cheesecloth. I called the number on the Silk box, suspecting an additive might prevent curdling, but they said no and that their test kitchen is also not able to get soy milk to curdle. They suggested adding corn starch, a thickener, but couldn’t provide any other info, such as when it’s added. They did say the proportion of 3 TBSNS per serving (whatever that means) is recommended. I added 6 TSBNS of corn starch, more spices and stirred my heart out. The result was a sicky sweet béchamel-like sauce flavored with garlic and dill. Yum (not really). I also asked the Silk folks if the ‘natural flavor’ makes unsweetened soy milk palatable to the general population by sweetening it up a bit. They denied this. With nothing to lose, other than some apple cider vinegar, I’m back to the chemistry experiment to see what kind of concoction I can come up with. I hope it doesn’t clog my drain when I pour it down the sink. This recipe has really worked for anyone? What’s the secret? Just tried the recipe. Disaster. The curds starting forming but then they all disappeared. All the liquid has just run through the cloth and there’s nothing left in the cloth. Any idea what I’m doing wrong guys? Thanks. I’ve read One-Hour Cheese by Claudia Lucero, a dairy cheese-making book, and the recommendations for troubleshooting the curds is more acid and control for heat. This recipe doesn’t show what temperature the soy milk should be at, but I would experiment with a digital thermometer strapped to the rim of the pot to get instant readings. See what temperature curds form easiest. For cow milk, the temperatures can vary anywhere between 90 degrees to 200 degrees, depending on the cheese. More heat means the curds will release whey and shrink, becoming firmer. For softer cheese, lower temperatures. But heat is crucial for curdling, so what else? ACID. Vinegar and lemon juice, especially, and sometimes fresh lemon juice has variations in acidity so that’s why it’s best to add a little more. I want to try this recipe word for word, but there are also other things you can try. Using enzymes will help speed up the curdling when using lower heat, such as vegetable rennet (totally vegan). I would first master this recipe before trying other versions. In addition, it may also be the stirring that’s causing the issue. More stirring means lower heat and it also disrupts the curds causing them to be small bits instead one big curd. I would stir gently, but continuously. Also, and this is more of a critique on this recipe, I would swap instruction #5 with #4, and no nuye! I would add the vinegar right when you begin to see curds, because that helps bring it out, assuming this is a recipe that calls for half lemon juice and half vinegar. 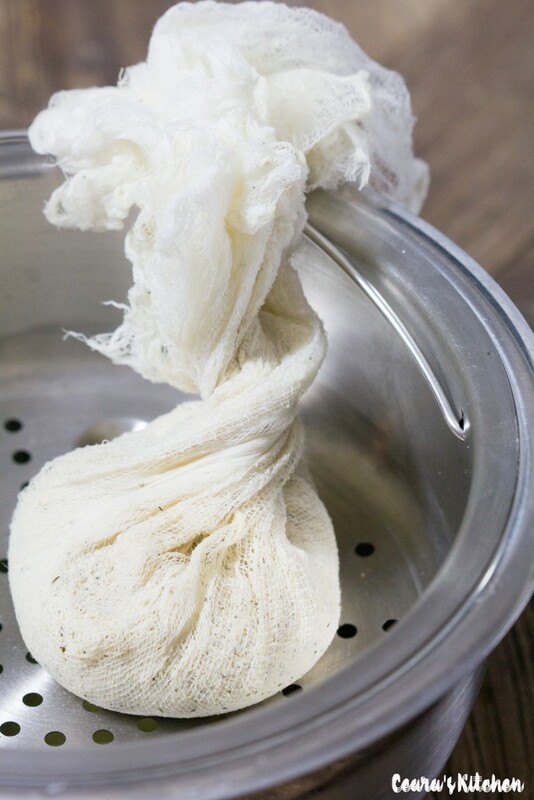 I would also add the spices and nuye once the cheese is in the cheesecloth, because you’re wasting ingredients by putting it in the whey and curds, and the flavor should be more pronounced. But do you think it will also work with light soy milk? I’ve yet to make this but used to make real ricotta in this same fashion but of course with whole milk… i have been thinking you could do the same non dairy… maybe soy is important due to the higher protein and fat content? I will definitely be trying it soon! Yay! Thanks! To me it looks exactly like a tofu recipe! I make and sell a gluten free vegan NY style cheesecake. Im looking for ways to cut my cost as retail vegan cream cheese is costly. I found your recipe and my question is, omitting the pepper, can this be used to make “cheese”cake? I really enjoy this cheese. 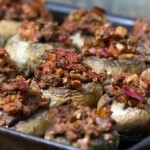 I added smoked paprika when I made it because as a vegetarian, I was a lover of smoky cheeses. I was kind of put off by the amount of wasted liquid after making this recipe. No matter, I simply added some corn starch and made an awesome Alfredo sauce with the runoff! Thanks for this recipe. I’m not a fan of all the nut-cheeses out there. This is perfect! Too bad Ceara doesn’t address the negative issues some are having. I didn’t get the results that I was expecting and was hoping to get some help in the comments section. Hey Debbie, I’ve made this recipe 3 times now, and the first 2 were a bust. Just got a good batch now. You don’t say what results you were expecting and what results you got, so it’s really hard to know how to help you. I started the soy milk on really high heat, stirring constantly but slowly. When it started steaming and small bubbles formed on the surface, I poured in the lemon juice. I used a really big pot, because the milk will “foam” up when the lemon juice is added. I turned down the heat to medium-low as soon as I added the lemon juice. I then added the salt and continued to stir for another minute. Then I added the nooch and the vinegar. As soon as I added the lemon juice, the soy milk curdled, but as I went along, it seemed to turn back into liquid. I poured it into cheesecloth anyway, and put it into the fridge with weights (a couple of bottles). This morning, I woke up to about 2/3 cups cream cheese. I also added 1/3 cup liquid coconut oil (for “mouth feel”) so all in all, 4 cups of soy milk netted me 1 cup of cream cheese. Hope all this helps. Oh – 1 more thing: I used a very thin dish cloth rather than cheese cloth, because I coun’t find a finely woven cheese cloth anywhere, and it needs to be a fine weave, at least that was my experience. Not sure what happened. I followed directions, but there was no insight on how many layers of cheesecloth to use. First attempt at straining failed; curds went thru the cloth. I added a layer of cloth and it took a long time to filter the milk. Chilled overnight as instructed. Very little “cheese” in the morning and not hard enough to plop out of the cloth. The smell and taste were good, but too liquidy for the frosting I was making. I’ll go back to using silken tofu for my vegan cream cheese in the future. Hi, I am not Vegan but am lactose intolerant so I like to use soy cream cheese for frosting (and to eat). I just ran across your post and would like to try making my own. My question for you is… have you ever baked with homemade soy cream cheese? I love cheesecake and want to venture into making a non-dairy version, but store-bought soy cream cheese is too expensive to test this idea. I’m just not sure how difficult it is to bake with a soy-based cream cheese. Any help you can provide would be greatly appreciated. Are there any suggestions about brands of soy milk? Coconut milk is my go to generally I haven’t tried soy milks but I hear that there are large variations in taste from brand to brand, we can’t do the carrageenan emulsifiers either. In the instructions “whey” is mentioned. Whey is an animal milk protein, it doesn’t exist in non-dairy milk. This refers to the vegan whey produced when the soy milk curdles and separates. I made this tonight and thankfully I read a comment that said to not be discouraged by the lack of curdling, it didn’t look like big chunks like you described but when I poured it in the cheesecloth, presto! It was a semi solid cheese block like I imagined. It’s in the fridge now, I can’t wait to try it. Thanks for the post! Yay! Let me know how you like the final result. Can I use cashew or flax seed milk instead? Cashew or flax milk will not work in this recipe. Can you use any other plant base milk like coconut. I’m asking because I have people in my household that have an allergy to soy milk. Also can you use this recipe for Vegan cream cheese as substitute whole milk cream cheese in desserts. Please can you tell me how to use this with tofu? I’m hopeless with switching up recipes but I assume the soy milk being strained is to make a tofu-like thing? Would it work if I stuck tofu and everything else in a blender (tofu substituting soy milk) and how much tofu? Can this be made with almond or coconut milk? I have a citrus allergy and can not eat lemon and i substitute it for something else as i really love cream cheese and since going vegan haven’t had any. What are your tips for making this work. I’m very excited but see as many “didn’t work” comments as “looks good” or “was good” comments. I’m dairy and nut allergic and am looking for a goat cheese type substitute. Thinking of doctoring a Daiya cream cheese but it would be nice to have a homemade version in my repertoire. I typically use Silk Soy Milk, also live near Chinatown so if that type of soy milk is preferred here, I can easily get. Looking for some guidance per the comments. THANKS. those of you thinking it failed, wait until you pour it into the cheesecloth, you will see the cheese! a lot of the liquid will then separate and there you go! i put sundried tomatoes in mine! Did you try coconut milk? I made this today using a soy milk that is just soybeans and water. It tastes delicious and I had no trouble making it. My question though is….is it supposed to be so dry and crumbly? I wonder if it is because my soy milk has no emulsifiers or oil in it. Might try making it again with another kind of soy milk. Oh and I tried to rate this recipe but it didn’t work. I would give it a 4! I also used just a soybean and water soy milk. I put mine in a food processor when I took it out of the cheesecloth and the texture became more like cream cheese! Can you leave out the yeast and have it still work? Could you leave out the yeast and have it still work. Can’t have yeast. Hey, this worked great! Thanks! I had an experience that seems to match that of a few of the others here in the comments. I panicked after adding the lemon juice and stirring for a minute… no significant curtling visible. Decided to be patient, added the spices and vinegar, and kept it on low heat for another couple of minutes, still no visible curtling. I must admit I felt like maybe the experiment had failed, but when I poured it over the cheesecloth….voilà! There were the curdles. May I suggest…simply changing some of the verbiage in your directions to reflect this part of the process? Thanks again for the great recipe, I’ll be making it again. I’m curious to know if you could help me modify this to use in a cream cheese muffin recipe. My recipe calls for cream cheese softened to be used as a filling. My daughter is allergic to nuts and I am recently trying vegan. Any suggestions? Hmmm.. Maybe without using any of the spices? The cheese would be a little bit bland though then. I would certainly add some sweetener if I was going to use this nut free cream cheese as a filling. If you try it, let me know! I made this cream cheese yesterday using Trader Joe’s unsweetened plain soy milk in the 1 quart aseptic carton. It worked perfectly. The cheese was very mild and I think I will increase the herbs and spices next time. Thank you so much for this recipe! I poured the curdled milk in to the cheese cloth lined strainer in the sink, tied the cheese cloth up, put a plate with a can of beans on top of the cheese, and waited about 10 minutes to get most of the liquid out before putting the strainer in a bowl overnight. That way I only had a few tablespoons of liquid left in my cheese to drip out overnight. I tried a soy cream cheese store bought in Atlanta and it was very good. I came home, I live in Chile, and tried to make the almond cream cheese but it didn’t compare. I was very happy with this recipie but seeing all the comments I am doubting whether to start. One thing a lady told me at a health store is that the milk has to be creamy. So I think maybe it is the kind of milk you are using. There is no control on that on commercial brands of soy milk. Maybe the suggestion from Ailleen Sforzina to start from scratch with home made soy milk will do the trick. I will try it and get back to you. I hope it will come out well. Thank you for the recipie. I tried this morning, and it was a colossal waste of good ingredients. It didn’t curdle. I will stick with the nut cheeses. I read it over many times and I even measured out the ingredients, so everything was at my fingertips. I ended up tossing it out. Oh No!!!!! What happens if it is sweetened? Does it not work at all, or is it just not a good combo for the spices (salt, pepper, dill and garlic powder add ins)? Although I only drink unsweetened Almond, my store does not carry unsweetened soy in any of the several brands they had. I did not realize you wrote that until I pulled the recipe to make it, but I looked for unsweetened because that’s all I normally use! Oh please tell me it will work, and if I leave out the spices I will just have more of a plain cream cheese type product! Are you the best vegan cook, or are you the best vegan cook?! Ive been reading the comments and everyone is saying theirs will not curdle. I had that problem too. After added everything in and taking it off the stove,I added more lemon juice(about 4 tbs all together) and apple cider vinegar (about 1 1/5 tbs all together) and let it sit for about 15 minutes after i put everything in. It curdled a lot more and it seemed to make a lot of cheese. I havent tried this yet but I will let you know how it tastes when its ready. Thank you for thr recipe! Thank you for the feedback Hailey! Can it be saved? Or what can I do with the liquid? I am sooo sad! Everything seemed to be going well, added everything, kept stirring, then nothing but liquid. What could I have done wrong? Oh nooo – what brand of soy milk did you use? I use the unsweetend soy milk from Costco (Kirkland brand). Immediately after adding the lemon, the soy milk should curdle. Is there any thickener in that soy milk? For instance I use west soy unsweetened plain soy milk only. But it does not have carageenan or any other kind of stabilizers. Will that negatively affect the outcome? I made tofu at one of the cooking classes I taught recently. This meant practicing at home first. The first two batches were perfect and I was congratulating myself that it was so easy and fail proof. Then I soaked the soybeans longer for the next batch as I was busy and didn’t make them into soy milk straight away. I wasted so much soy milk with the ensuing batches of tofu. The tofu yield was minimal as the soy milk barely curdled. After some research I discovered the two vital secrets to making soy milk that will make successful tofu. Firstly, use dry soy beans that are fresh, secondly make sure you don’t soak them for longer than 6-8 hours and thirdly don’t over cook the soy milk before adding in the coagulant (lemon juice). 1. Soak 100g (1/2 cup) dry soy beans in plenty of water overnight but no longer than 6-8 hours. 2. Drain soaked soy beans and discard soaking water. 3. Place soaked and drained soy beans into blender or food processor and grind to a pulp. 4. Gradually blend in 1 litre of filtered water until well blended. 5. Pour this mixture into a large saucepan and cook for 10 minutes (Thermomix: leave mixture in Thermomix bowl and cook for 10 minutes at 90•C on speed 4). 6. Place a fine strainer, lined with a muslin cloth or nut milk bag, over a clean bowl. Pour cooked soy bean mixture into strainer through muslin cloth or nut milk bag. Press the pulp with the back of a spoon to extract all the liquid. 7. Retain the strained milky liquid in the bowl. This is the soy milk. The residue or pulp is called okara and can be used in burgers or waffle mixture, fed to the dog or discarded. It may be frozen until you are ready to use it. I hope this is helpful to those whose recipe failed. Thanks for your advice, it’s good to know! I followed instructions and waited for the milk to boil, stirring all the time and then adding the lemon juice once it started to boil. Mine did not curdle. I have been stirring for ages. Same here, if I find out I’ll let you know! This is such a cool idea. I tried it today but after I put in the pepper the curds disolved and I only have flavored milk now. Any ideas to remedy this? Thanks. Ceara, how much was this supposed to yield? I followed this recipe EXACTLY, having read it many times, so I wouldn’t mess it up, had everything measured out in little bowls and it maybe, yielded 1/4 cup of cheese. This is too expensive to waste soy milk like that. I didn’t get any large curds either. What do you think? What do I do with the rest of the milk that’s been boiled? Mine was just as bad as yours. It sucked. Got next to nothing and followed it exactly. What a waste of time and money. 🙂 Thank you so much Francia! Can’t wait to hear your feedback! Question what can you sub for Apple cider vinegar? I am allergic to apples. Huge Thanks from a french girl who used to love cheese and was, until this lunch, craving so very much for boursin ! This is absolutely MERVEILLEUX ! So happy that you enjoyed the boursin, Amelie!!! 🙂 Thank you for your lovely feedback!!! Thank you so much, Bianca 🙂 Not exactly like tofu – the texture is just like boursin cheese!! Let me know if you end up trying it! So that’s the case? Quite a reelavtion that is. Looks amazing Ceara! I saw a soy cream cheese a couple months back ago but she used agar with hers, nice to see you were able to make this without agar!! It looks soooo much more creamy and smooth too! Love the colors of it! Love that you added dill to it as well, and of course pepper, I add black pepper to mine too and it’s my favorite flavor in cream cheese. How did you know only soy would work? Just trial and error? Thank you so much Brandi!!!! I was so happy that this worked well without the agar and ingredients I always have in the pantry! And yes, trial and error – I used to make cheese in a similar way before when I ate dairy and was inspired by my stepmom who grew up eating cheese made this way as well with dairy milk! We gave it a go with soy milk and we were so blown away by the results and how easy it was to whip up! Could you leave out the nooch, dill, and garlic powder f you wanted to use the “cheese” for something sweet? Or are they integral to getting the cream cheese flavor? They are pretty integral for the cheese flavor – especially the nutritional yeast and garlic powder. You could probably try switching up the dill for other spices though! I seriously had no idea you could make vegan cream cheese without nuts! Mind blown! This is genius! I can’t wait to try this. PInned!Thank you, Ceara.